Good Morning! Here is another Field Flowers card that I pulled out of my stash for this set. I actually made this card a couple of years ago, but wanted to show you another Field Flowers card. This really is a beautiful set and can be used for a variety of things – weddings, thinking of you, sympathy, mother’s day, birthday, etc. The details on this cards: 1. The card base is marina mist cut in half at 5 1/2″ and scored at 4 1/4″ to make the card base. 2. The background is night of navy cardstock cut to 4″ x 5 1/4″ and embossed with a victorian embossing folder which is no longer available. If I were making this card today, I would use the beautifully baroque embossing folder. 3. I added a little dimension to the background of this card by stamping with the En Francais background stamp with marina mist ink stamped off. I then used the now retired set – Fresh Vintage (a SAB set from two years ago) and very lightly stamped a couple of flower images, stamping off on scrap paper first. I then very lightly sponged the edges of the white cardstock. 4. The flower stems are stamped with Always Artichoke ink. The flowers are stamped with night of navy. I stamped the background image first on a scrap paper to “stamp Off” and create a lighter image for the background of the stamp. I then used the detail stamp with night of navy ink over the background image. 5. This piece is layered onto marina mist card stock. I scalloped the bottom edge of the card stock using the scallop trim border punch. 6. Next I stamped the sentiment “with Love” with night of navy ink and punched it out with the oval punch. 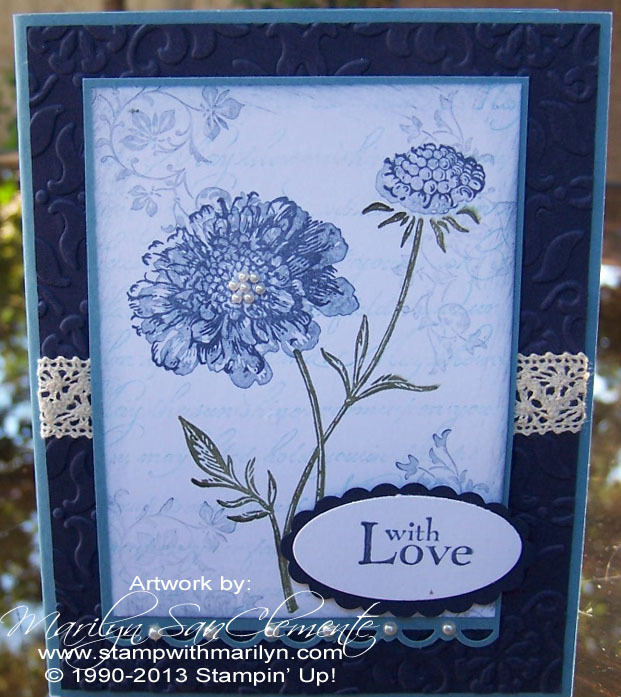 This is layered onto a piece of night of navy card stock punched with the oval scallop punch. 7. Last but not least are the Embellishments. I used a layer of Victoria Crochet Trim and the pearl jewels to accent the center of the large flower and the scallop on the bottom of the floral layer. I hope you have enjoyed this card sample! Field Flowers, handmade cards, Stampin' Up!, STampin' Up! cards. Bookmark. Love this card, marilyn! I will need to CASE it! Thanks Judy – CASE away! !